A very decorative Trewhiddle strap end with split-end terminal to accomodate the strap and two rivet holes. Nicked border to imitate beading, stylised palmette beneath the rivet holes. The central pattern is decorated with pairs of leaves from a central bud, below are two beasts looking backward, all with dotted decoration. A stylised animal-head terminal with distinctive round ears and square snout. Plain reverse side. Ref: Thomas, G., 2000. 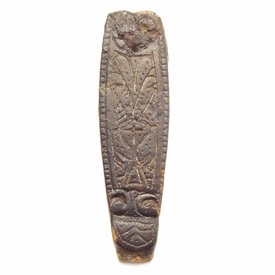 A Survey of late Anglo-Saxon and Viking-age Strap-Ends from Britain. 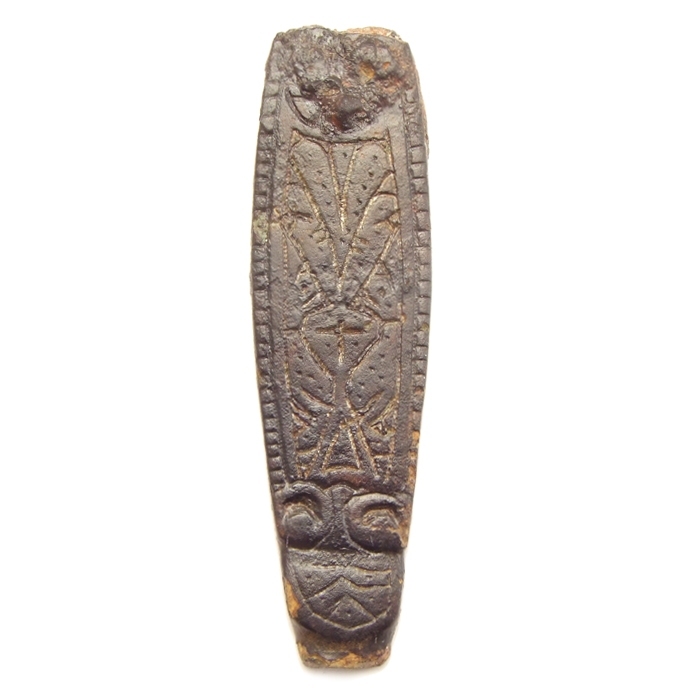 In Northern Europe strap ends have been used since Roman times and remained popular among the Anglo-Saxons, Vikings, Merovingians, and Frankish tribes. They were attached to straps to prevent them from fraying or curling (functional), but also had a decorative appeal as their added weight made them hang down vertically. There is a great variety of shapes and decorations, some have very intricate patterns or zoomorphic designs. They can range from the fairly plain to very ornate pieces, made from silver or silver-gilt.